The title of Gilner’s article suggests the rhetoric of a typical curmudgeon bemoaning the loss of a better time, often arguing for a return to a golden age when music meant something and when artists didn’t need autotune. This sentiment can also be found in the 1956 article, “Performer’s Gyrations May Doom Rock n’ Roll” by syndicated columnist John Crosby. In his criticism of Elvis Presley, Crosby wrote “The last appearance of this unspeakably untalented and vulgar young entertainer brought forth such a storm of complaints both from the press and public that I imagine any entertainer would hesitate to try him again on television.” As critics of Mr. Milner’s article also point out, he only covers a slice of new commercial music being written today. In fact, we are in a golden age of diverse musical expression, and finding new music has never been easier. Despite what his critics may say, Milner is correct that music is louder than it used to be. At the very end of 2009, the popular NPR podcast, “All Things Considered,” produced an episode titled, “The Loudness Wars: Why Music Sounds Worse.” In it, the podcast discussed how signal processing had changed the character of recordings, and hypothesized how engineers in 2009 might approach music written 20 years earlier. The episode clearly placed the blame for an increased loudness squarely on the choices of audio engineers. Like many terms in music, compression has a different meaning depending upon its context. We often use the word compression to describe a process of making computer files smaller, for example. Lossy compression, such as MP3 compression, permanently removes audio data in order to reduce the file size. This is not the type of compression that Milner writes about in his article. Instead, Milner writes about compression that audio engineers employ to reduce the dynamic range of audio signal. What is compression in this context, and why do we use it? Let’s start with the “what.” First, a compression reduces the dynamic range of an audio signal. In the example below, Figure 1a is an amplitude representation of a drum track. Notice the contrast between the peaks and the soft areas. Figure 1b is the same drum track, but significantly compressed. In this one, the difference between softs and louds has been greatly diminished. Figure 1a clearly has more “punch” to it while the second example has less dynamic range and dynamic contrast. A compressor has a number of components, but for this article, I’m only going to cover three: Threshold, ratio, and gain makeup. Figure 2 is a screenshot of a common plug-in for dynamic manipulation used by audio professionals today. The threshold is a level setting, typically in decibels, at which the compressor begins and compression of the audio occurs. Any part of the audio that does not exceed this threshold level is unaffected by the compressor. That is, the compressor is simply bypassed until the audio exceeds the threshold. The ratio is the amount of compression, and is really the component that is responsible for reducing the dynamic range of the audio. Typical ratios include 2:1, 4:1, and 8:1, and these ratios are tied to the threshold. A 4:1 (“four to one”) ratio means that for every four decibels that the audio exceeds the threshold, the signal will be reduced to one decibel. The final component I’m going to cover is gain makeup. It’s this component of the compressor that allows audio engineers to increase the volume of recordings. Once the dynamic range is reduced via threshold and ratio, the overall volume of the audio is reduced. It’s at this point that the compressor can raise the entire volume up to the where the peaks were before the compression was applied. In other words, compression ultimately raises the soft parts of an audio signal. But why is compression used? 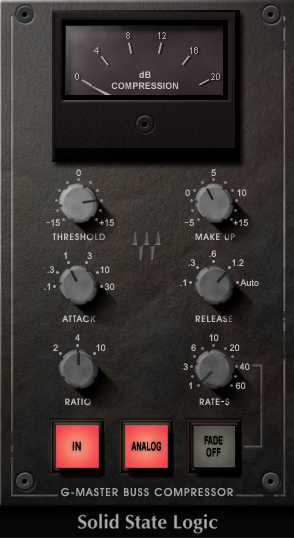 In commercial music, there are a number of reasons why sound engineers will utilize a compressor. Often times, pop singers drop consonants at the beginning or end of works, so traditionally, compressors are used on vocal tracks to help make words more intelligible. Compression is often used to “tighten” individual sounds in order to give them more punch, often on individual drum tracks. Compression can also be used to make room for other instruments in the mix. That is, the input of the compressor can be used to compress the output of another instrument. This side-chain compression is very common in dance music where the sustained bass part “ducks” under the kick drum, or put differently, the compression on the sustained bass instrument occurs when the kick drum, not the bass, exceeds the compressor’s threshold. When Milner and others discuss compression and its relation to the loudness of music today, this is what they mean. Stating the obvious, the music business is a very competitive market. Marketing research has found that consumers listen longer to music when it’s louder than what they previously heard. In other words, when you dial across radio stations or randomly click on songs in Spotify, you will likely listen longer to the song if it is louder than the song to which you were previously listening. Through digital audio, dynamic range has actually increased. There is a greater distance between the dynamic peak and sound floor, or put another way between “loud” and “soft.” Critics of the perceived “loudness war” who point to the overuse of compressors as a culprit, simply miss the point. The fact is that, although compressors are employed quite abundantly and relied on by engineers too much at times, the dynamic range of pop music has not actually decreased that much. The loudness range today is quite similar to what it was 40 years ago. Yes beyond a doubt, music is louder; however, it’s not entirely due to new mixing or mastering techniques. Instead, we should consider also that stylistically, music itself has evolved and changed. As an example, let’s consider recordings of classical music. Typically, compression is used very sparingly because the dynamic range of a classical work is very important to its musical structure. This is why you may find yourself adjusting the volume frequently when listening to a classical recording. Before digital music, the peak limit and noise floor were actually quite close. This is why you may hear a hiss when listening to soft parts of a classical recording on a vinyl album or cassette tape (both are analog media). Compare that to a recording of a classical work made after 1995 or so distributed digitally. In this case, you will still have to adjust the volume frequently, but you likely will not hear a hiss during the soft parts. Commercial pop music simply takes advantage of digital technology. Prior to mass digital distribution, bands often relied on the addition/subtraction of instruments, thus changing texture, to get louder/softer (crescendo/diminish). These bands would use harmonic function or tempo changes to delineate sections of songs. Today, in a predominantly beat driven popular musical culture, changing dynamics is employed to provide structural contrast. In other words, music technology is serving its purpose in this case – it is providing the foundation for musical expression that was not possible during Gilner’s golden age of music. Simply put, Gilner is correct – they don’t make music like they used to. Thank goodness. For a more in depth discussion and support of this position, see: https://www.soundonsound.com/sound-advice/dynamic-range-loudness-war.